We stopped counting the number of wrongs in this YouTube.com video at 1,453. But somehow these little kids acting out the best movie ever made in Miami is too hard to turn off. The video is called "Scarface School Play" and stars a mini-Tony Montana and a kindergarten class full of other goons and cocaine addicts. It's arguably the most popular clip on YouTube right now, but it's not really a class play - not that it makes it any less inappropriate or a viral hit. 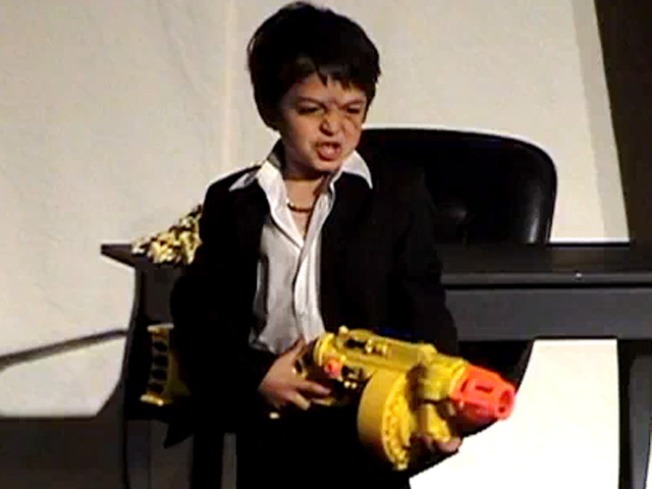 The kids, dressed in the similar bad Italian suits from the original, use toy guns as weapons for the gun battle scenes and a mound of yellow popcorn to to symbolize the white blow Montana used to rise to power. And we all know how kids are addicted to popcorn. Most of the action happens as the words "The World is Yours" is plastered on the wall behind the tiny actors. That wouldn't be such a bad message for kids, if it wasn't for all the violence, drug use and profanity. As far as the script, there are a few alterations worth noting. Montana's favorite word is now fudge, as in "You want to fudge with me. You fudging with the best." And for the most part, you can't understand a word mini-Montana is saying. According to TMZ.com, the pint-sized parody is actually the work of Rockhard Films and the kids were from a casting agency in L.A.
That makes us feel a lot better about watching it 20 times.